WE JUST GOT A NEW BATCH OF JAPANESE COOKING UTENSILS IN THE SHOP. EACH UTENSIL IS EXCEPTIONALLY SMOOTH AND DURRABLE, CARVED OUT OF MULBERRY WOOD. MULBERRY TREES WERE ORIGINALLY CULTIVATED IN JAPAN FOR USE IN THE PRODUCTION OF SILK. THE BARK IS ALSO USED FOR MEDICINAL PURPOSES, WITH PROPERTIES THAT LOWER BLOOD PRESSURE. 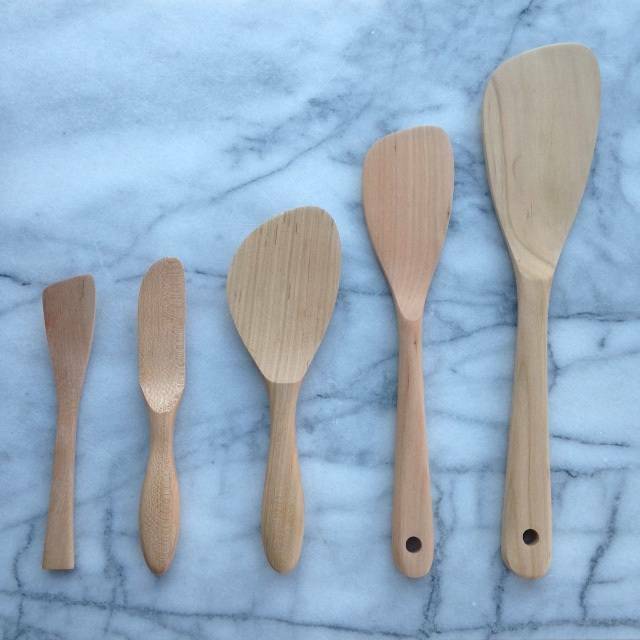 THE CHARACTERISTICS OF THE MULBERRY WOOD AND THE GORGEOUS HONEY TONES MAKE THEM A GREAT MATERIAL FOR COOKING UTENSILS. MY FAVORITE IS THAT RICE SCOOP IN THE CENTER. THE HANDLE IS AN ABSOLUTELY PERFECT SHAPE AND THE HARDNESS OF THE WOOD MAKES IT PERFECT FOR CRUSHING GARLIC TOO. OH! MY SECOND FAVORITE IS THE LITTLE WOODEN KNIFE. ANY UTENSIL THAT SERVES CHEESE IS A WELCOME ADDITION TO MY TABLE!